These brochure design tips will help you get started quickly and make effective designs for your business. Don't underestimate the importance of creating a fresh, clean and engaging brochure. Successful brochure design can grab the audience attention and make them read the information inside. It's a highly effective way to promote your business. Here are some essential tips for making outstanding brochures. Asking yourself who are the target audience of your brochure. Who will buy your product or service? How old are they? What do they like? Focus on the correct range of people and create the style and content fit to their interests and requirements. Headline usually is the first message that comes into the audience eyes. If you want to get immediate attention, a charming and attractive headline is very crucial. The headline should be short and catchy. Make sure it contains the key selling point, which will persuade them to continue reading. Make sure your content is brief, easy and attractive. People don't give much time on your brochure, so get to the point. Select feature-rich bullet points; use small paragraphs and punchy headings. Your aim is to let customer understand your offerings with the least words in the shortest time. Images are as important as texts, and sometimes images could be more intuitive than words. A good image will catch the audience's eyes at the first glance. The image you choose should speak for your product and deliver your message directly. 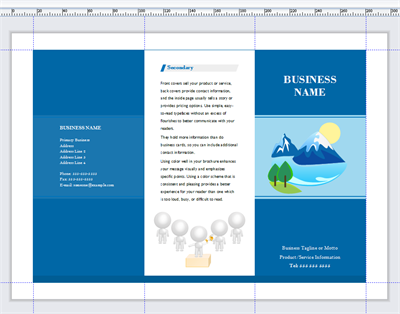 Choose high quality picture, and use appropriate color tone to fit for the whole brochure design. Making your brochure creative and unique is very important. It decides whether the audience would like to read or not. Thinking about the features of your product or service, and make a special design associated with what you sell. There are many great designs on the internet, view them and get inspirations. Make sure the brochure has a clear call to action, so that the audience knows what you are asking them to do. Give them an incentive to move forward for your product or service, such as a free sample, discount coupon or gift. This will lead them to get to know your business deeper and include you as a consideration when they need such product or service. Check over and don't miss the following information: phone number, email address, website address, business address and opening times.